As its name suggests, it is an interface to the cloud that hosts the applications on a server to connect customers. Data storage is done on the server or locally. Jolicloud uses Debian Linux for the file system and HTML 5 for the interface. It has the recognition of touchscreens. It can operate together with Windows, and as Android, to be chosen by the user to start very quickly and allow immediate use of applications such as a browser or send emails. 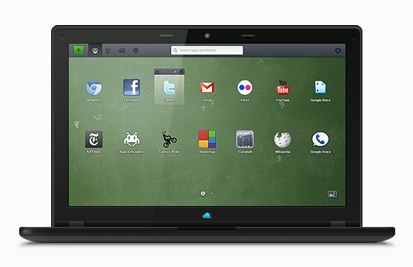 Unlike Chrome OS, the system can run native applications outside the browser. The user interface built in HTML 5. My Jolicloud, an online space that contains applications, and the user can customize. The user can use Linux applications including a browser, or Wine for Windows applications, or applications online in their personal space. Online applications can run offline for some of them. What we found on a computer, screen, taskbar, icons, windows, all this is designed in HTML 5. This format is becoming a competitor to XUL and other interface languages such as XAML and JavaFX. Such a system seems particularly useful when you want to use a mobile device with a dock to connect to a video monitor, a keyboard, a mouse, peripheral units. This completely replaces the desktop and adds an additional mode of interaction, the touch screen on the tablet or the smartphone. But Jolicloud will have a serious competitor: Windows 8 is offering a dual interface, in HTML 5 for immersive apps in Metro, and Windows Desktop for common applications.